As one of its initiatives the Anandpur Sahib Heritage Foundation is working on an Art Residency program, where we will be highlighting the holy town of Anandpur Sahib in Punjab as a global tourist destination, through the arts. 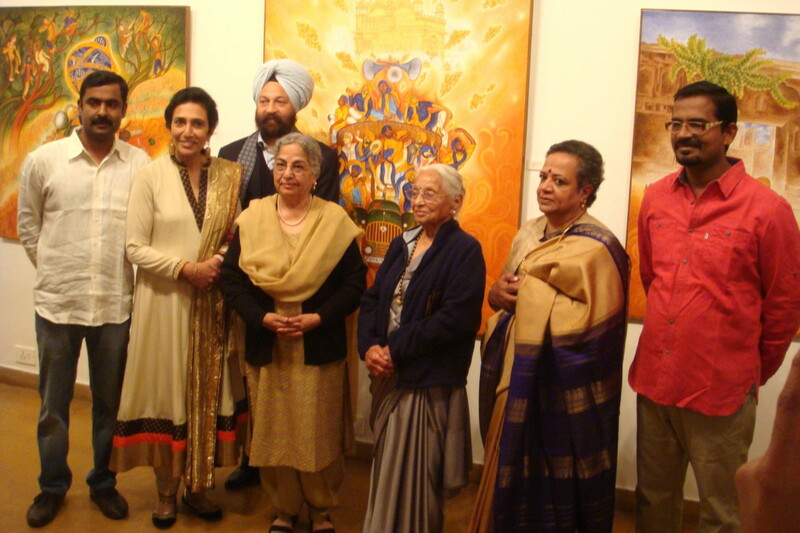 The Anandpur Sahib Heritage Foundation in association with Gallery Dravidam organised an exhibition titled ‘Holla Mohalla – An Enduring Celebration -1’. 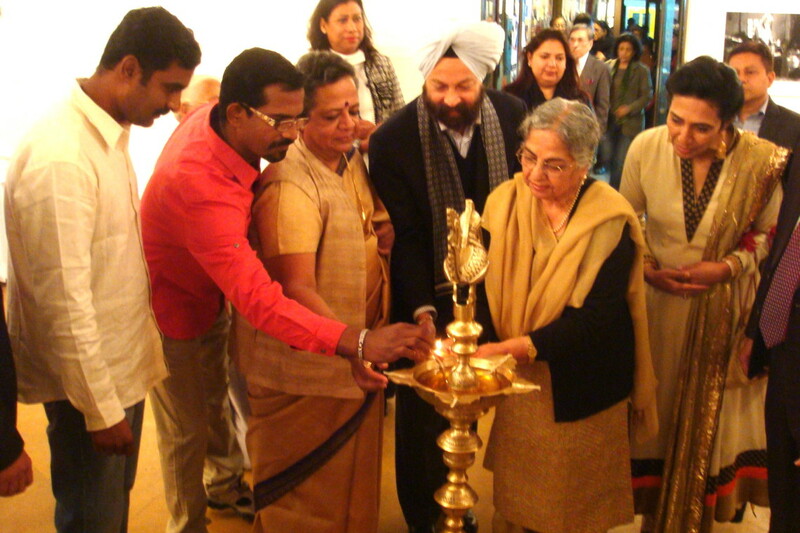 It was held from 21st to 24th of February 2014 at the Visual Arts Gallery, India Habitat Centre, Lodhi Road, New Delhi. 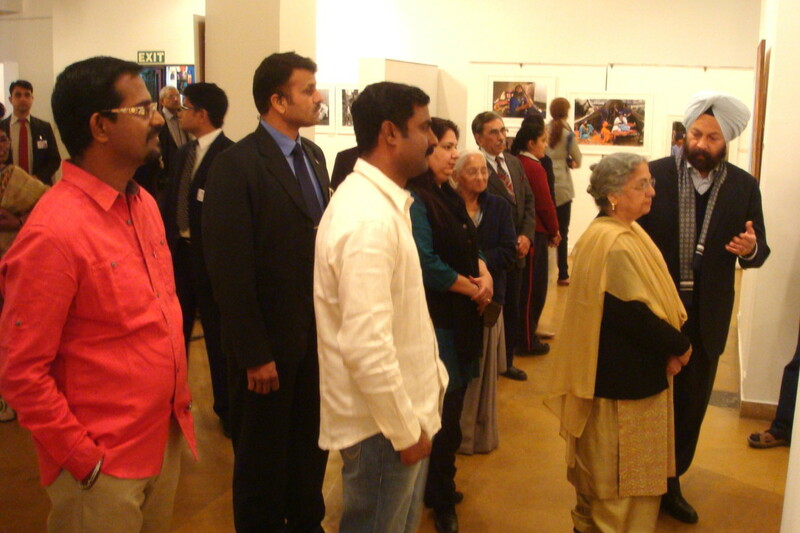 The exhibition was inaugurated by the Chief Guest Smt. 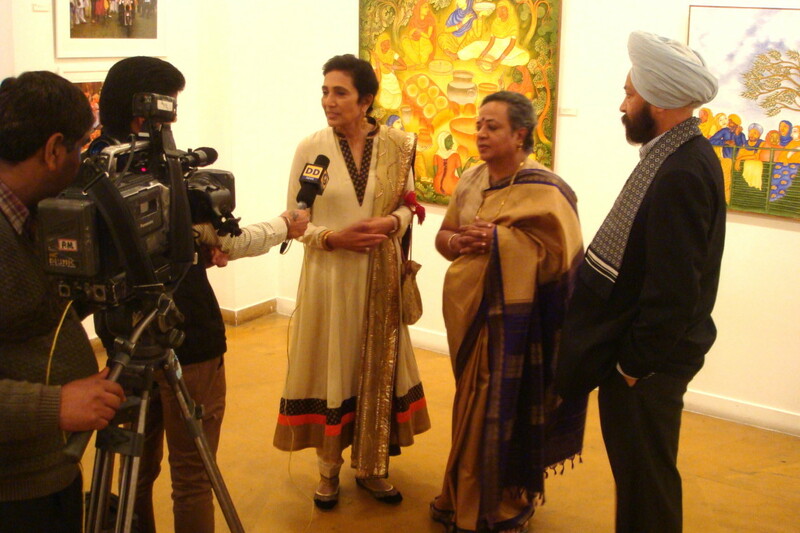 Gursharan Kaur, wife of the then Prime Minister Shri Manmohan Singh. 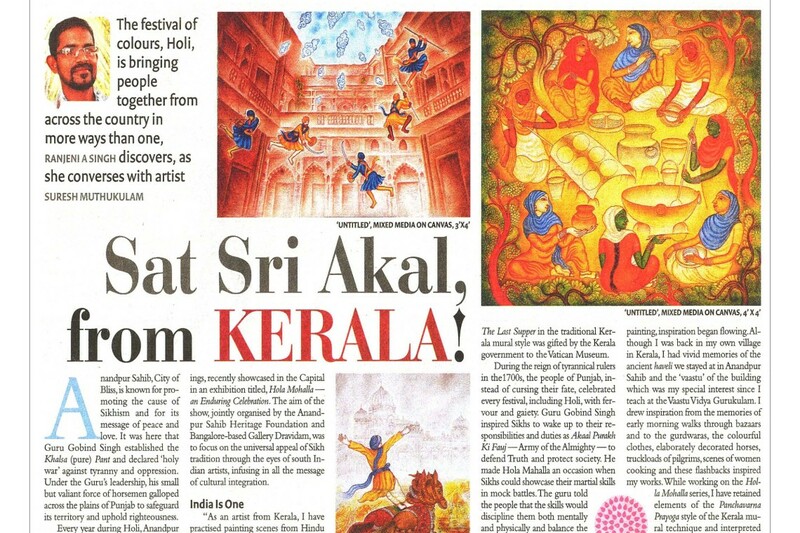 In March 2013, under the auspices of the Anandpur Sahib Heritage Foundation and Gallery Dravidam, artist Suresh Muthukulam from Kerala, and photographer Cop Shiva from Karnataka were invited to attend the Holla Mohalla in order to present this vibrant festival. 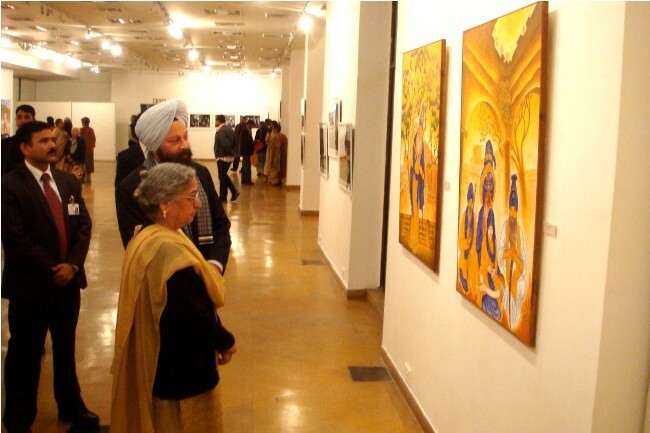 This art exhibition highlights the universal appeal of the Sikh tradition and the festival of Holla Mohalla seen through the eyes of two South Indian artists. 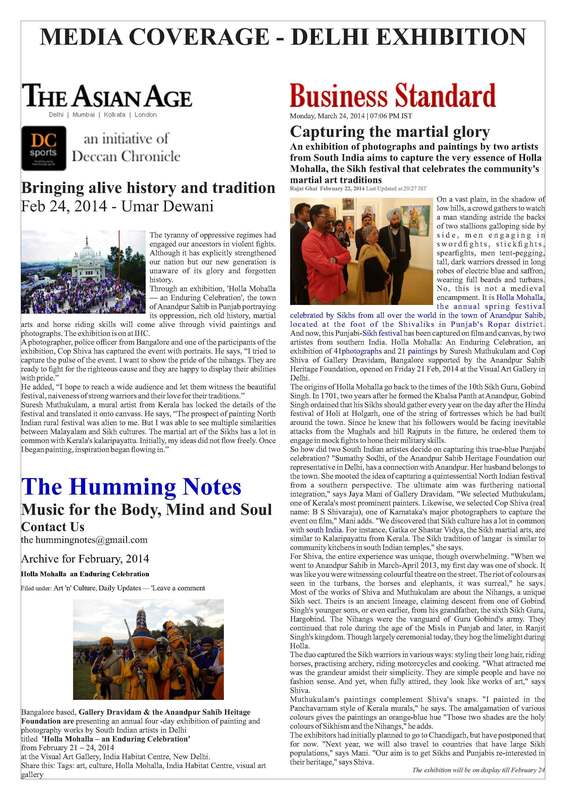 Through such events we hope to spread the message of national integration. This event will be a curtain raiser to future art events featuring the heritage and traditions of Anandpur Sahib. 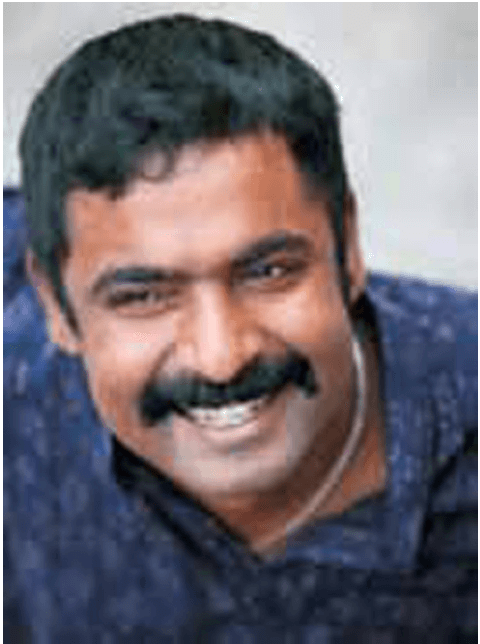 Shivaraju B.S aka Cop Shiva is a policeman in real life and learnt photography to document events. He spent his youth growing up in a village near Bangalore .His interest in photography grew fro being part of an alternative art collective named 1 Shanthiroad Studio. Here he met local photographers and learnt to document the complexity of rural and urban India. He focused on portraiture as a genre and is fascinated by the idea of masquerade and roles people play in their public and private lives. He followed a school teacher, Bagadehalli Basavaraj , as a Gandhi impersonator..This ongoing project studies Gandhi’s ideals in contemporary India. His portfolio includes a series of intimate portraits of urban migrants, people of alternative sexuality street performers and others living in the hinterland of urban and rural conflict. Shiva continues to capture the diversity of humans who live on the edge and represent the spirit of our times. In March of 2013 , in Collaboration with Gallery Dravidam (Bangalore ) and the invitation of “The Anandpur Sahib Heritage Foundation”, Anandpur Sahib, Cop Shiva was invited to capture through his camera, the pulse of The Holla Mohalla at Anandpur Sahib during the festival of Holi .With his portraits of turbaned Sikhs , outdoing each other with intricate and elaborate designed turbans and also subtely focusing on the five K’s-Kesh-uncut hair, Kanga-comb, Kirpan-dagger, Kada-bracelet, Kaccha-sporting underwear, each one of these having a specific spiritual meaning exemplifying the warrior character of the Khalsa, Cop Shiva successfully captured the mood and vibrancy of this spectacular event. Cop’s curious lens continued to document moments from daily life, cooking at the langers-community kitchens, dressing and the daily acts of adornment, the action of martial arts on the streets, equestrian sports and Kabbadi. The various indigenous martial art traditions displayed practiced skills of self defense and attack. Cop Shiva in his distinct style was able to absorb the heaving crowds in a riot of colour and capture the mood of this vibrant and pulsating gathering, like an ocean of humanity keeping their faith. 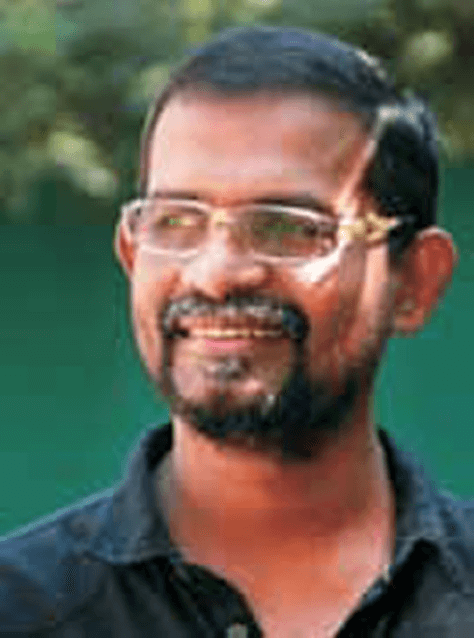 Born in 1971, Suresh Muthukulam grew up in a small village nestled in the verdant backwaters of Kerala. Even as a two year old, he would spend hours drawing and painting and followed his passion to become one of the most creative contemporary artists in India today, following the 9th – 18th century Kerala mural tradition. His rst formal training was in the Indian gurukulam system, aer which he completed a four-year Fine Arts course. He traveled widely in Kerala, visiting temples and palaces where he was so inspired by the ancient Kerala murals, that he went on to do a ve-year course in the Kerala mural painting technique and trained under the legendary Sree Mammiyoor Krishnakutty Nair. I learned from him that all artists regardless of which culture or media they are using, have to completely immerse themselves in the structure and technique of their chosen path. Suresh follows the ancient technique of mural painting, using as far as possible, natural colors and the elements of this tradition to create works on canvas in a contemporary aesthetic style. Some of his works are a combination of images from the puranas and everyday village life. ey capture the rustic and the rural infused with the divine. His inspiration lies in the portrayal of the reincarnation of gods and mythological forms in everyday situations. Suresh’s recent portrayal of ‘e Last Supper’ in the traditional Kerala mural style, was gied by the Kerala Government to the Vatican Museum. His work on Mahatma Gandhi’s Salt March is part of the Gandhi Museum Collection in New Delhi. More recently a 17 foot mural executed by him adorns wall at the newly opened Mumbai International Airport T 2 terminal, where artworks by India’s top traditional andcontemporaryartistshavebeendisplayed.Suresh hastheskillandvisiontospeakofoursecular times and bridge the past with present. 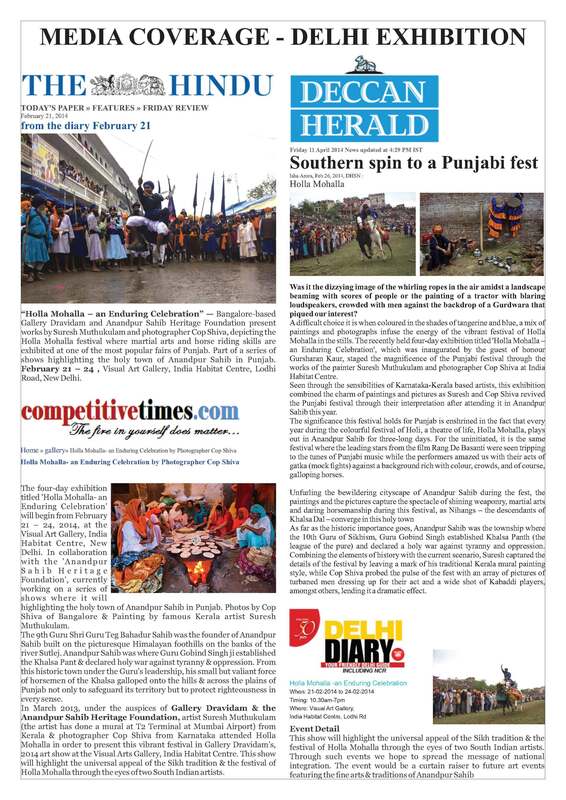 In March 2013, Suresh spent time at the Holla Mohalla festival as a guest of the Sodhi’s of Anandpur Sahib and Anandpur Sahib Heritage Foundation. His keen eye has captured whimsical details of the Holla Mohalla which he translated into canvas’s in his trademark style borrowing elements from the traditional Kerala mural style. Sureshalsomanagedtocapturethespiritofthefestivalinanaestheticthathenurtures.His captivating canvas’s explore the vitality of the Nihang Singhs Martial Arts relating it to Kerala’s Kalaripayattuand the similarities in action and movement of these two unique traditions.